Among the many bizarre stories about the North Korean dictator, Kim Jong-un, was one a few years back reporting that he had given an order that all male university students in the country were to have their hair cut in a style that imitated his own. Such displays of ego often seem a bit comical, but there is a long history of political rulers demanding similar sorts of worship from their subjects. In the ancient world, such leaders just came right out and declared themselves to be gods, and insisted that the people worship them as such, on pain of death. Kim Jong-un’s haircut edict seems relatively tame by comparison. 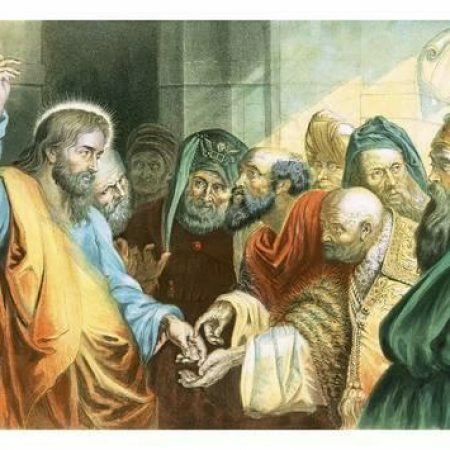 There is another example going on in the background of the gospel reading that we heard tonight about the attempt to trap Jesus with a question about paying taxes to the Romans. The question was a trap because the Romans were a hated foreign occupation force, and the Jewish people deeply resented paying taxes to them, so if Jesus said, “Yes, you should pay your taxes to the Romans,” his popularity rating would take a plunge in the next opinion polls. But of course, if he said, “No, refuse to pay the tax,” he would probably be arrested by the Romans within minutes, and the Jewish authorities would have got rid of him without having to lift a hand themselves. It seemed like the perfect trap. But Jesus manages to spring the trap without getting himself caught in it. “Show me the coin used for the tax,” he says, and they hand him a coin. Snap! He’s got them already. This incident took place inside the temple precinct, and you were not supposed to bring such a coin into the temple. That’s why they had money changers at the temple. Jesus’s question points straight to the reason you weren’t allowed to bring these coins into the temple: “Whose image is this, and whose title?” The image on the coin was the emperor’s and the inscription read, “Tiberius Caesar, Son of God, high priest.” To any devoutly religious Jew, that made the coin a blasphemous idol, an insult to God. Certainly not something you could bring into the sacred temple that was holy to the one true God of Israel. So Jesus has already gained the upper hand in the argument when the Pharisees make the strategic error of letting it be seen that they have carried this despised image into the temple. This tendency of self-obsessed rulers to promote their own image for worship and adulation has some interesting implications. It is often said that imitation is the sincerest form of flattery, and no doubt that is why Kim Jong-un thought everyone should imitate his hairstyle. He believed himself worthy of such flattery, and it was his subjects’ duty to give it to him. The hairstyles and clothing styles of the most popular royals have always set trends, but it looks rather tragic and self-defeating if a ruler tries to enforce it. But their desire to be imitated is enormous. It does have definite limits though. A narcissistic dictator is delighted if people imitate his appearance and mannerisms and perhaps speech style, but they never want people to start imitating their tendency to grab power and take control. Anyone who does that is instantly a rival and an enemy. A mirror-image enemy perhaps, but certainly an enemy. Imitation is not allowed to go that far. Imitation always has a risk of rivalry. A couple of teenagers both modelling themselves on the same celebrity may be drawn together by their common obsession, but they can just as easily become the bitterest of rivals in their quest to stand out as the most perfect imitation of the celebrity model. Imitation can be fraught with such dangers. Yet, in our reading from Paul’s letter to the Thessalonians, we heard the Apostle commending the Thessalonian believers for becoming “imitators of us and of the Lord”. This is one of a number of places where the Apostle suggests that the usual pathway to growth in faith and discipleship is by imitating others who have already made some good progress in their imitation of the Lord. And of course, the call to “follow” Jesus is a call model ourselves on Jesus or imitate Jesus; not his hairstyle, but his way of doing things, his attitudes and values and behaviours. There is an important reason why imitating Jesus does not carry the same risk of plunging into rivalry that these other examples of imitation carry. The reason is that Jesus is not the least bit threatened by our imitation. He is not in rivalry with us or anyone else. And because Jesus is not a control freak who seeks to grasp and monopolise power, there is no danger that people imitating him will end up seeking to usurp him. Jesus’s pattern is to empty himself of power and to offer himself as a servant of all, so anyone who truly imitates him in that is not going to end up staging a military coup to seize power. The Apostle Paul uses this paradox to make a joke in another place, saying that if you want to compete over something, see if you can outdo one another in showing love. Since loving one another puts an end to trying to outdo one another, it all becomes sillier and funnier than Kim Jong-un’s haircut, and the Apostle has made his point in the best possible way. It is true that modelling ourselves on other people who in turn are modelling themselves on Jesus is one step riskier, but I am quite sure that the Apostle doesn’t think we should be indiscriminate in who we take as our models to imitate. We are not being called to some sort of naive hero worship. Paul and many of the other great leaders of biblical times constantly remind us of their thorns in the flesh and their feet of clay and their treasure in earthen vessels, etc. They make no claim to be perfect, and they urge us to be wise and discerning, and to only follow their example as long as they can be seen to be following the example of the Lord. On Wednesday week, we will be gathering with our neighbouring churches to celebrate All Saints Day. It is a day when we especially remember and give thanks for those who have gone before us and set us an example and been good role-models for us. The Church’s attempts to create a regulated system for the official recognition of saints has sometimes become rather silly and self-defeating, and some of those who have been declared saints were anything but, but there is still great value in acknowledging and remembering those, living or dead, whose lives and examples show us the way and reveal the light of God to us. In our first reading, Moses wanted to be able to see the image of God too. He asked to be able to see God so that the memory of that vision might sustain him in the difficult days and years of leadership that lay ahead of him. Moses was the one who others were going to be following and modelling themselves on, and he was desperate for a clearer view of the Lord he was following himself. And this event was closely related to this same kind of question about good and bad images, because it arises out of the incident of the golden calf that we heard about last week. There is not that much difference between a gold coin proclaiming the emperor as a god and a golden calf being worshipped as a god. Always, the attractive thing about making your own gods is that you can project on to them whatever values and characteristics you like. When we choose our own gods, we can become as self-referential as Kim Jong-un, because the gods we are imitating are in fact imitations of us, created in our own image to embody our own needs and desires. Idol worship is generally just a vague disguise for the kind of self-worship that the likes of Kim Jong-un and Tiberius Caesar don’t even bother to disguise. But Moses rightly recognises that the best protection against such idol worship or self-worship is to really know the true living God, and so he pleads for the opportunity to see God. And in a bit of divine humour that is usually lost in translation, God offers to let him catch sight of the divine backside as God passes by on the mountain. I’m not sure whether you’d want to go as far as saying that God flashes his bum at Moses, but that’s pretty much what the text says! You want to see me: that will have to do you, Moses! In Jesus we have been given a much fuller image of God, God’s frontside if you like. But for those of us who do not live in Galilee in the first century, most of the time most of what we see of Jesus is seen as the image of Jesus appears in other people whose lives are lived in imitation of him. Faithful and godly people become like three dimensional icons of Jesus, windows through which we catch glimpses of the true image of God. And the point of all this imitation is that we might grow into such icons ourselves, into the fullness of the image of God in which we were created. Which, strangely enough, brings us all the way back to Jesus and his response to the tricky taxes question. And what is it that is allowed into the temple that bears the image of God? You and me. Human beings created in the image of God. Human beings learning the way of Jesus by following him and imitating the best of what we see in one another and thus growing more and more into the destiny for which we were created, the fullness of the image of God. There is no disgrace in bringing that kind of image into the temple. In fact, that is the whole purpose of coming into the temple: to give back to God what belongs to God, our whole selves, in worship and thanksgiving and faithful service. That’s what we are gathered here to do tonight: to offer ourselves to God and to one another, that we might learn from one another, and see Christ in one another, and grow into all we can possibly be, all God intended and hoped for us to be. Look around you. Yes, there are images of Christ present in the icons, in the scriptures, in the bread and wine that we will share shortly. But most importantly, and most revealingly, there is the image of God in each and every person gathered here. So let us treat one another with the honour due to the holiest images of God, and let us continue to let the light of Christ shine in us and through us to the glory of God.